Get unlimited access to all session recordings and slides ! 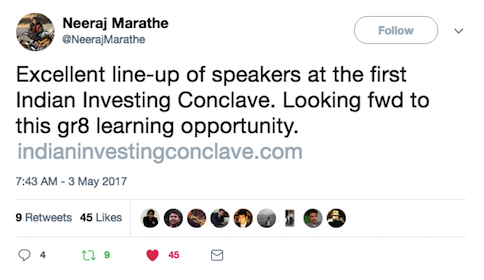 Indian Investing Conclave this year is scheduled for 1-2 June 2019. We will have 15 instructors to share their top investment ideas and show participants how experts go about analyzing a business, assess management quality and determine the valuation. Who should attend? Anybody with interest in investing. Whether you are a student, a newbie analyst, a fund manager or a full-time individual investor there will be lots of takeaways from wisdom of veterans. Participation Certificate: All participants will get a participation certificate, which can be highlighted in resume as well as LinkedIn. Our instructors include some of India’s finest fund managers, head of research, analysts and full-time value investors. Participants & instructors had an incredible time attending the last conclave. Get a glimpse of their enlightening experience in the following tweets.